This is just a quick round-up of recently viewed movies, as well as a handful of titles I'm looking forward to. Click on any title for a link to the pertinent trailer. Click thumbnails to enlarge pics. I watched Silent Night (2012) this week - a very loose remake of Silent Night, Deadly Night (1984) - and I really wasn't quite sure what to make of it. It was more visually ambitious than I expected. In fact, it was often quite stylish. Care was taken. Unfortunately, I believe it was let down by a script that could have used another pass. Mostly just a shrug for me. Here's to hoping that I'll finally find my perennial Christmas horror movie when I watch Rare Exports (2010) on Christmas Day. Though I've seen a handful of exceptionally good genre movies recently - Some Guy Who Kills People (2011), Excision (2012), The Bay (2012) - I haven't really been looking forward to any upcoming releases. Well, that all changed today. 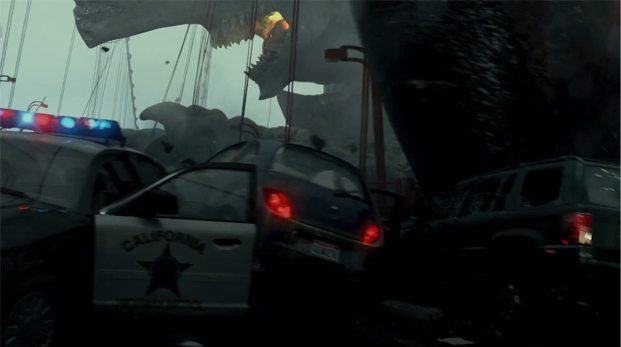 The first official trailer for Guillermo del Toro's upcoming massive monsters versus massive robots epic Pacific Rim (2013) hit the Internet on December 12th, and I somehow didn't bumble across it until today. Oh. My. God. July can't get here soon enough. I was bummed when del Toro's adaptation of H.P. Lovecraft's At the Mountains of Madness fell apart, but it looks like he's still getting his Cthulhu on with these gigantic horrors from the depths of the Pacific. I'm also super excited about American Mary (2012). Starring Katherine Isabelle (the Ginger Snaps trilogy), this Canadian production wowed audiences at the Toronto After Dark Film Festival. It premieres theatrically in the U.K. on 1/11/13 with a U.K. disc release following on 1/21/13. Hopefully, this means we can expect a North American release soon thereafter. I'm going to do my damnedest to procure a copy of this as soon as possible, and I'll be sure to report back. Haters are gonna hate, but I've been convinced ever since the release of House of 1000 Corpses (2003) that director Rob Zombie has at least one more brilliant movie in him. I think The Lords of Salem (2012) might be that movie. It releases 4/26/13. Finally, I read today that director Andreas Marschall's giallo homage Masks (2011) has been procured by Sony Pictures Home Entertainment for imminent North American distribution. I'd never even heard of this one before today, but the trailer makes it look like it could be the best giallo that Dario Argento never directed.